WEST LAFAYETTE, Ind. 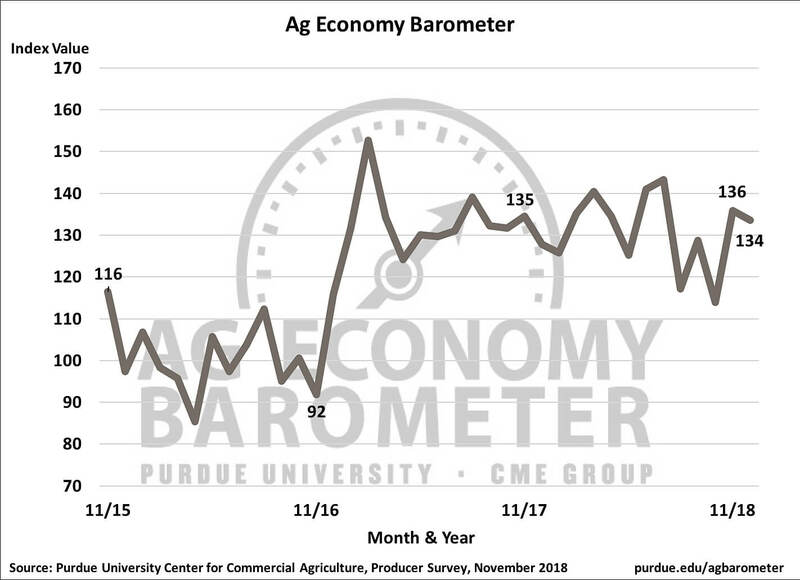 and CHICAGO, Dec. 4, 2018 /PRNewswire/ -- Agricultural producer sentiment held steady in November with producers remaining optimistic about the state of the agricultural economy, according to results from the Purdue University/CME Group Ag Economy Barometer. The November barometer reading of 134 was only 1 percent lower than October, which is similar to levels seen last spring before trade disruptions began. The barometer utilizes a survey of 400 agricultural producers from across the country. The barometer's two sub-indices remain mostly unchanged from October; the Index of Current Conditions held at 115, and the Index of Future Expectations dropped 3 points to a reading of 143. That confidence can be seen in producers' attitudes towards their willingness to make large farm investments. Each month producers are asked whether now is a "good time" or "bad time" to make a large investment in buildings and machinery. Their responses are used to produce a large investment index. In November, that investment index stood at 56, up from 52 in October and 10 points higher than in September of 2018 when the index set a new low of 42. Producers were also more optimistic regarding their long term perspective on farmland values, with 50 percent expecting higher farmland values over the next 5 years, a sharp departure from a month earlier when just 21 percent said they expected higher farmland values. However, this increase in confidence was not driven by expected improvements in profitability. In November, only 13 percent of respondents said they expect farm profitability to improve in the next 12 months. When asked about farmers' equity position, 44 expect to see equity diminish in the upcoming year. Rising interest rates could also be a factor in these perceptions as a rise in interest rates can impact profitability and the value of large farm assets. When asked, 85 percent of producers said they expect interest rates to rise in the next year and 76 percent expect to see a rise in the next 5 years compared to 2018. With November marking an end to the mid-term election cycle, producers were asked whether they were concerned that Congress had not passed new farm bill legislation. Seventy-five percent of respondents said they were either "somewhat or very concerned," 33 percent said they were "very concerned," and 24 percent said they were "not at all concerned" about the lack of new Farm Bill legislation. Read the full November Ag Economy Barometer report at http://purdue.edu/agbarometer. This month's report includes additional information on producers' future expectations for agricultural exports and an update on producers' intentions to reduce their soybean acreage in the 2019 season. Additional November barometer analysis can also be found in a video from Mintert at https://youtu.be/Q-9NqD14EdE.